What is Automatic Language Identificator (guesser)? Automatic Language Identificator also known as guesser. It's a system can help determine which language given content is in. You needed to enter some words on unknown language and then click "Guess" button. System will tell you what language it's in and also percent of identification. Enter a sentence of 20 or more words. Use upper and lower case correctly. 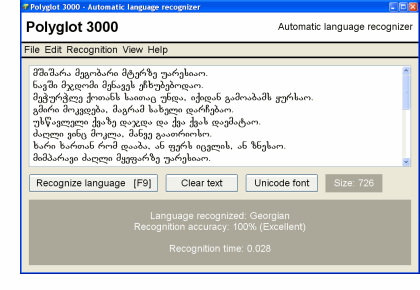 Polyglot 3000 — is an automatic language identifier that quickly recognizes the language of any text, phrase or even single words. It is available for Windows 95/98/NT/ME/2000/XP. Software Recognizes more than 400 languages, supports Unicode, has a convenient user interface, multilingual interface (English, German, French, Spanish and others).